Posted April 10, 2006 in 2006/04, 7 Freelance, Archie, Artists, Morrow, Gray, Periods, z Archive. In 1959 Joe Simon made an agreement with Archie Comics to produce two superhero lines, “The Adventures of the Fly” and “The Double Life of Private Strong”. The Fly was a new creation, although it was based on an earlier, unpublished Simon & Kirby idea, “The Silver Spider”. The hero for Private Strong was called the Shield. But it was not the same character as the orignal Shield that Archie (then called MJL) published during the war. This Shield had a new origin and new powers. Perhaps the Shield’s new powers were a little too good. As Joe tells it, once over a poker game DC threatened to sue Archie because the Shield was too much like Superman. That would explain why the “The Double Life of Private Strong” only lasted two issues. A cancellation that was much too soon to have been based on sales. Probably because of the untimely termination of Private Strong, Joe ended up with a six page Shield story (“The Den Of The Doll Man”) that was never published. The story was penciled by Gray Morrow but was never inked. Morrow was just out of service during the Korean War and I don’t believe he had worked for Simon before. Even though the story was not used, Joe must have been happy with it because Gray would later do work for Joe’s comic magazine called Sick. 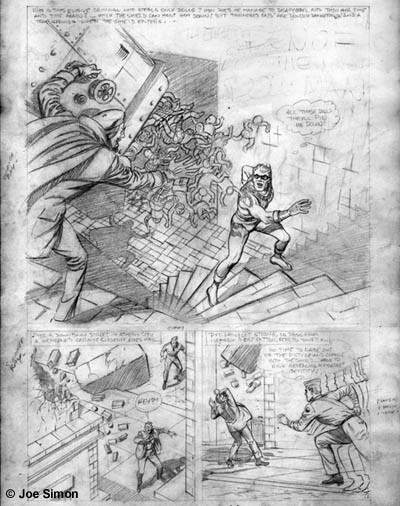 Morrow worked on the Shield story in a very light pencil. I’ve used Photoshop to bring up the contrast in the scan I provide. He used a more realistic style then was done on previous Private Strong or Fly stories. Generally speaking Gray handles the action scenes well. But in one panel he has the Shield hurdling through space only you have to read the legend to realize that he has just jump off the Brooklyn Bridge. My biggest problem with the Shield story has to do with the script. For one thing the pacing is a bit off. There is a fairly long chase sequence leading to a confrontation that is over much too quickly. Even more important then the pacing, is frankly the story is just too lame. It involves the Shield trying to find out who is stealing dolls from children. If that wasn’t bad enough the thief’s secret weapon against the Shield is to dump a load of dolls on him. There is a larger image here. Although Private Strong was cancelled, the Adventures of the Fly continued. At some point Joe decided not to let Morrow’s Shield story go to waste. In the margins of the art pages, Joe began to rewrite it into a Fly story. It would seem that Simon also felt the script could use some improvement. Where the Shield saved a man from an accident, the Fly not only saves him but in doing so reveals his secret identity. Joe was also going to change the villian’s use of dolls into a strange ray gun. But Joe did not get too far. His margin notes end on the second page and other then erasing the title, no art work was modified. Joe Simon’s production of the Fly ended with the fourth issue. A very different Adventures of the Fly would continue without Simon and perhaps this explains why Gray Morrow’s art work failed to get used a second time. But in a way Joe was not done with the Fly. Many years later the copyrights for the Fly would come up for renewal. As creator Joe decided to try to regain the rights. This may sound like what played out twice with Marvel and Captain America. But actually it is a really different story. The Adventures of the Fly had ended years ago (1965). Archie Comics really had little interest in superheroes, they still make too much money off of Archie and his pals. Joe and Archie made a deal part of which has Simon getting the copyrights back. I’ve seen the original document for this deal, it is hand written by the two parties. I am sure lawyers were later brought in to formalize the agreement. But initally it was just a couple of guys sitting at a table, talking over their differences and reaching some compromise. Doesn’t this sound like how things should be done?